Regarded by many as one of the greatest all-round drivers in the sport, Fernando Alonso is determined to add to the two world titles he secured with Renault in the mid 2000s. However, his abrasive character saw him leave Ferrari under a cloud after five years without a title and his return to McLaren in 2015 coincided with three of its worst seasons since 1980, posing the question of whether Alonso is destined to spend the rest of his career at the wrong team at the wrong time. 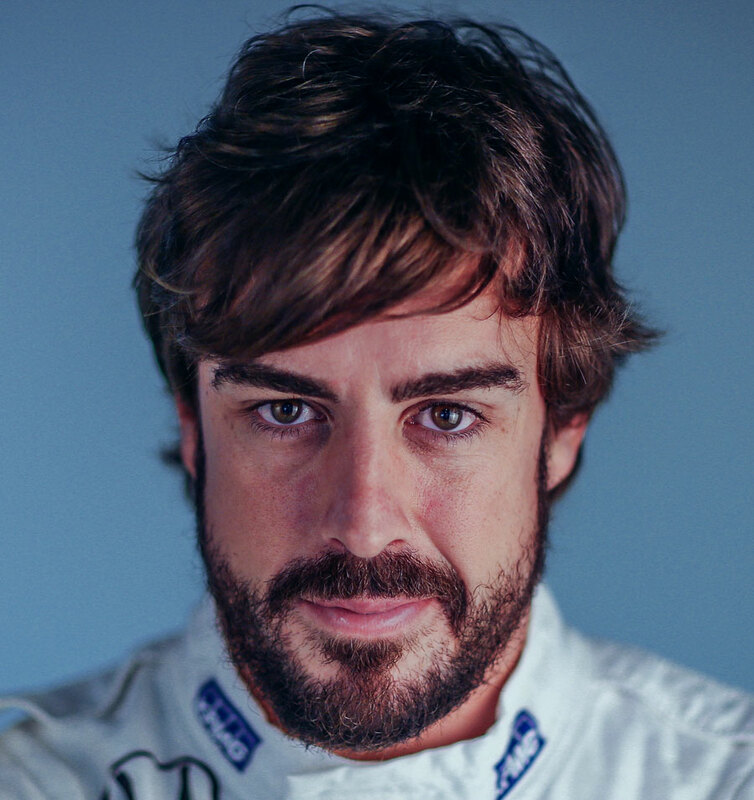 Following a successful period in go-karts, in which he became world champion, Alonso stepped up to car racing in the Euro Open Championship for Nissan in 1999 and won the title. He moved to F3000 the following year, but Renault boss Flavio Briatore had already recognised his talent and organised a testing role with Minardi. He got his first F1 seat with the same team in 2001 and put in some impressive performances despite the car's lack of performance. Keen to broaden Alonso's skillset, Briatore put him in a testing role at his own team Renault the following year. Renault rewarded him with a race seat in 2003 and he recorded his first win at the Hungarian Grand Prix just a few months later. In 2005 he became the youngest ever world champion, beating Kimi Raikkonen to the title. Six wins from the first nine races followed in 2006 and even though Michael Schumacher kept the pressure on, he could not deny Alonso his second title. The Spaniard joined McLaren in 2007 and while the opening races of the season went smoothly, it soon became clear that tensions were building between Alonso and his rookie teammate Lewis Hamilton. In the belief that Hamilton was being favoured by the British team, a bust-up with team boss Ron Dennis followed and the relationship became poisonous. He finished the year third in the championship (tied on points with Hamilton and one point behind champion Raikkonen) but was no longer welcome at McLaren and had to return to Renault. With the undisputed No.1 status he craved, his second stint with Renault was relatively disappointing with just two wins, one of which included the Crashgate-tainted Singapore Grand Prix. Renault's 2009 package was uncompetitive - he scored just one podium all year - and after months of rumour, he agreed a multi-year deal to join Ferrari. Following a near-miss in 2010, in which Alonso lost the title due to a strategic error at the final round, he hoped to go one better in 2011 but Vettel and Red Bull again proved dominant. At the start of 2012 it looked as though things were going to get worse, but a series of gritty results in an uncompetitive car left Alonso leading the championship over the summer break. However, in the second half of the year two retirements due to first-lap collisions allowed Vettel to take the lead into the final round in Brazil. Alonso finished just three points off the Red Bull driver at the final count after a gutsy campaign in which he arguably earned more respect than the the new three-time world champion. 2013 promised more with Ferrari trying to deliver a car to match Alonso's performances, and started well with second place in Australia and two wins from the first five races. The encouraging start faded away and tension appeared to be rising between Alonso and Ferrari as public jibes at the team received short shrift from president Luca di Montezemolo. The arrival of Kimi Raikkonen in 2014 brought about an eagerly-anticipated driver line-up at Ferrari but it didn't provide the battle fans had hoped for. Alonso did not look troubled by the Finn, dominating his new team-mate in a season where he once again drove the Ferrari to, and sometimes beyond, its limits. Two podiums in the hugely uncompetitive car was scant consolation for his efforts though. Alonso's 2015 seat was the subject of much intrigue as soon as it became evident Sebastian Vettel was set for a switch to Ferrari and, as soon as it became clear a move to Mercedes was not on the cards, Alonso completed a sensational return to McLaren -- a move previously unthinkable due to his falling out with team boss Dennis in 2007. However, the promise of a renewed McLaren-Honda partnership did not materialise in 2015 and a series of retirements and power deployment issues saw him score just 11 points (his worst tally since his debut year with Minardi). Things did not improve in 2016 or 2017 and Alonso lobbied hard for McLaren to make the switch to Renault power for 2018. Aside from a third world championship, Alonso also has his sights set on motor sport's triple crown after taking part in the 2017 Indianapolis 500 and signing up to race at Le Mans (as well as the majority of the 2018 WEC season) with Toyota. He has astonishing consistency and will battle hard regardless of his position and chances of a strong finish. He has made clear that he demands No.1 status in a team and can be incredibly political if he believes he is not being given the opportunities he deserves. After qualifying 16th in Brazil in 2005, he raced to third position to claim his first championship and ended Michael Schumacher's period of dominance in the sport. With tension between himself, McLaren and team-mate Lewis Hamilton reaching a peak in qualifying for the 2007 Hungarian Grand Prix, he deliberately blocked the pit box to ensure Hamilton could not start his final qualifying lap ahead of the chequered flag. He claimed pole position as a result but was subsequently penalised. "Out of the car, I was never able to understand him; to me he is an indecipherable character, an enigma." Former Ferrari technical chief Aldo Costa on Alonso in 2014. "I might not be fastest, or the most technical but I am consistent." "Instead of complaining, moaning and bitching, which is what Alonso is doing at the moment, all he needs to do is concentrate on driving quicker." Niki Lauda. Alonso is claustrophobic and is terrified of being stuck in a lift.